Lee Min-Ho’s character, Lee Yun-Seong, in City Hunter is a cross between John Rambo (in the first 2 episodes) and Jason Bourne (in all the remaining ones). He’s utterly amazing! There’s pretty much nothing that character can’t do! There’s a cool scene in a locker room where he fights a bad guy. Maybe “fights” isn’t the right word because it implies both men are hitting each other. Lee Yun-Seong finishes the guy off so quickly that the dude never has a fair chance to really “fight” him. 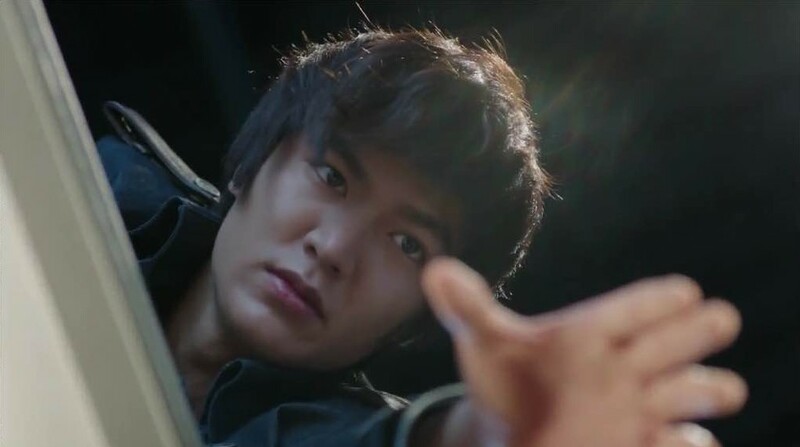 Lee Min-Ho’s hands are so fast, in some kind of martial arts way to the guy’s chest, that you can almost miss it if you’re not paying close attention. Jackie Chan would be proud! City Hunter (based on the Japanese manga of the same name) is an action packed, suspense Kdrama that is completely engrossing from start to finish. Some high up government guys send a handful of men on a mission to North Korea and then decided it would be better if the men didn’t return so they have them killed. One guy, Lee Jin-Pyo, lives and decides to avenge the evil deed. He kidnaps his dead friend’s newborn son and goes into hiding in Thailand. He raises the child as his own, the boy, Lee Yun-Seong, thinking he is the man’s biological son. Needing money for his revenge scheme, he becomes a big drug dealer. He carefully trains Yun-Seong to become an elite soldier/spy because his plan is for his friend’s son to eventually be the one to carry out the revenge. When Yun-Seong finds out the truth about how his real father was murdered, due to the order of those government men, he is more than willing to get back at the men who were responsible for the whole thing. Jin-Pyo and Yun-Seong finally go to South Korea to begin their own brand of justice. However, Jin-Pyo wants every man involved in the plot that killed his comrades dead, and Yun-Seong has a less vengeful heart and only wants to turn them in so the law can punish them. As a result, Jin-Pyo and Yun-Seong are no longer united and end up going against each other to make sure justice is served in their own way. Of course, along the way Yun-Seong falls for a girl, Kim Na-Na, who is in charge of protecting the president’s daughter. Before his mission even starts he is warned by Jin-Pyo to not fall in love because his mission is a dangerous one and the girl he loves can easily be a target in order to get to him. If he truly loves someone he shouldn’t put her in a life and death situation. He should have listened to his “father” because falling for Na-Na just complicates his life and mission. But the romance makes the drama a lot more enjoyable so the writers knew what they were doing. And as a side note, there’s a scene on a rooftop where Yun-Seong and Na-Na kiss, and BOY what a kiss! Lee Min-Ho is fantastic in this. There hasn’t been a thing he’s done, that I’ve seen, that I didn’t like but City Hunter is probably my favorite. This was a role he was able to sink his teeth into… a complex, physically demanding role. His character is not just walking around town in a nice suit and falling for a cute girl. He played hard in this show and it resulted in him receiving four different awards, including Best Actor at the Korea Drama Awards. I think he definitely deserved it! The action in this drama is first rate. There’s a lot of it and it’s quite intense, especially the fight scenes. I’ve always thought action scenes would be difficult to shoot. The director did an excellent job, so much so that he was nominated for the award of Best Director. I don’t know who/what show he was up against but he certainly would have had my vote. The ratings were up there, as high as 19.6% nationwide. You get almost 20% of your country watching a show and you know it’s a hit. The music is great. Love songs and intense classical kind of stuff equally add polish to a great drama. The soundtrack is pretty large and was released in 7 different parts. You should check it out. I love it. City Hunter was actually shot in Thailand as well as South Korea. The scenery in the first 2 episodes is very pretty, with the lush, green jungles of Thailand giving the show a Rambo kind of feel. It’s the one and only Kdrama I can remember having a jungle in it. Very unique. I’m positive this Kdrama would appeal to men and women alike. The action and romance blend together naturally to make it a show you watch with your head AND your heart. Turn it on and get ready for a face-paced roller coaster ride called City Hunter. I certainly appreciate you following this site. Hopefully, you’ll find these reviews enjoyable as well as informative. There are plenty to chose from. Happy Kdrama watching!